When managing your production, you will want to search and filter scenes to accurately track progress. In the Web Control Center, you can search scenes by user or state, or both at the same time. ‣ To search for a user, select one from the Select a User list. The Scenes list updates to display only the scenes assigned to the user you selected. ‣ To search for a state, select one from the Select a State list. 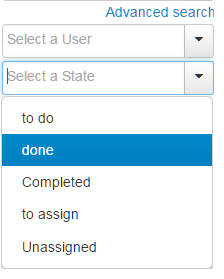 The Scenes list updates to display only the scenes assigned to the state you selected. 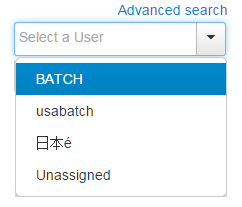 In this example, we searched for a user named BATCH and a state called "done". The result is one scene displayed below. ‣ Click Advanced search to close the search fields. Click Advanced search again to reopen the fields. ‣ Place your cursor in a search field and press Backspace repeatedly until the field is blank.